As always, you are an enthusiastic bunch! I love the energy that shows up in the Facebook Event Group before and during the swap. 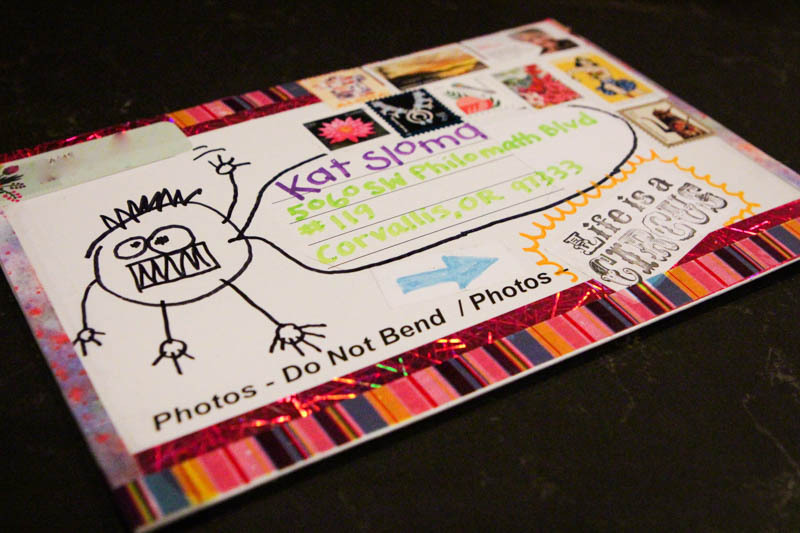 I think this year the sharing of the postcards in their new home was especially creative. Thanks for stepping that up! 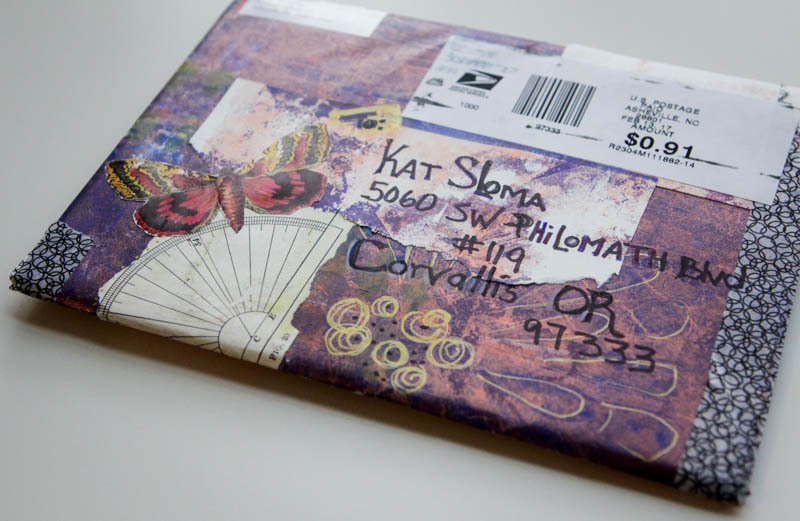 One of the goals of the swap since the very beginning has been to foster connections between artists in different places and mediums. 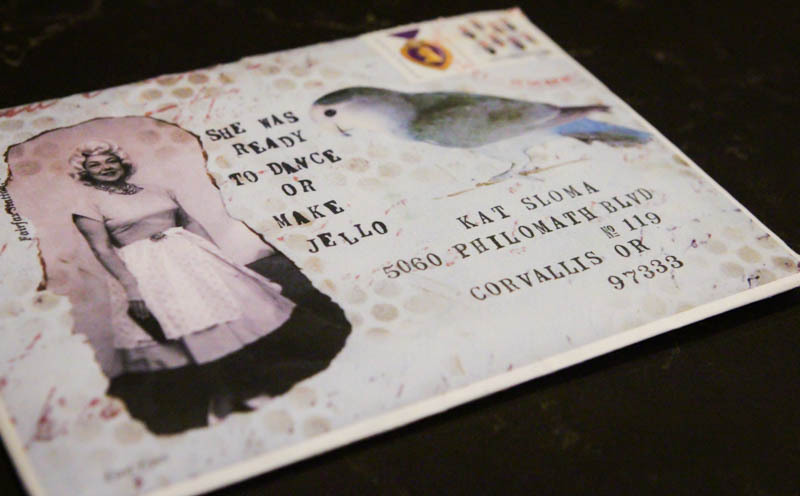 The requirement to add an email or web address to the postcards was new this year, and I hope it encouraged you to reach out and connect with your fellow artists via email or online. Everyone likes to know where their postcards landed. Four simple words which are clues to an expressive, playful and free approach to making art. Let’s keep those four words with us over the next year as we make and share our art. I have a feeling that great things will come along if we do. Now it’s time for the video! 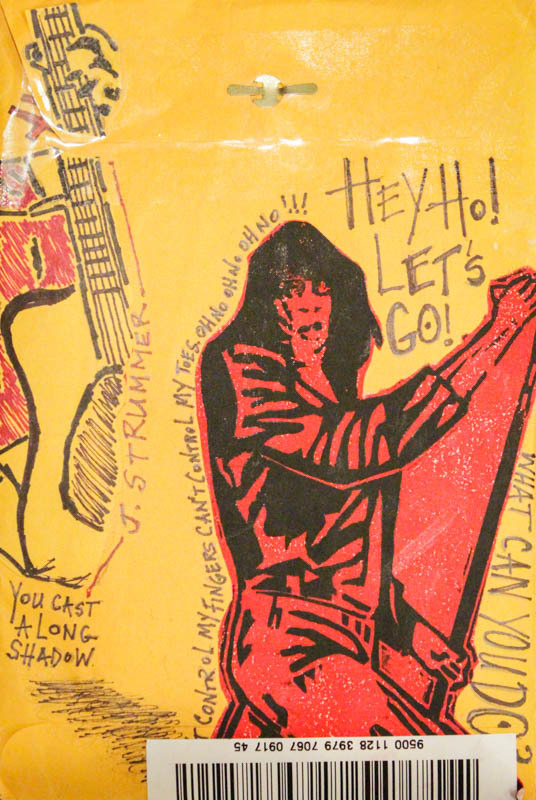 Let’s take a look at the art liberated in the swap. I received images from 100 of the artists in the swap for the video this year, so it’s still not everyone, but seeing this much art in one place is definitely inspiring. 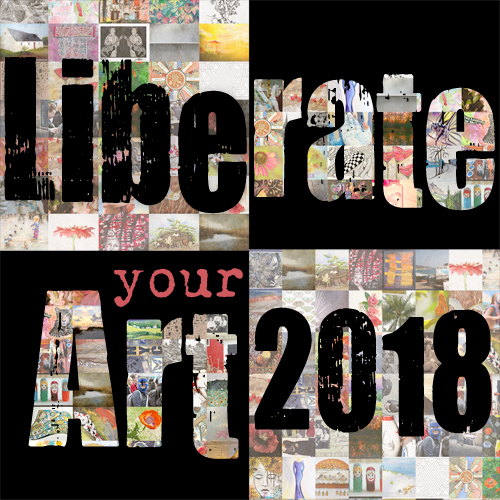 Thanks to everyone for liberating your art this year! This swap is not possible without YOU. 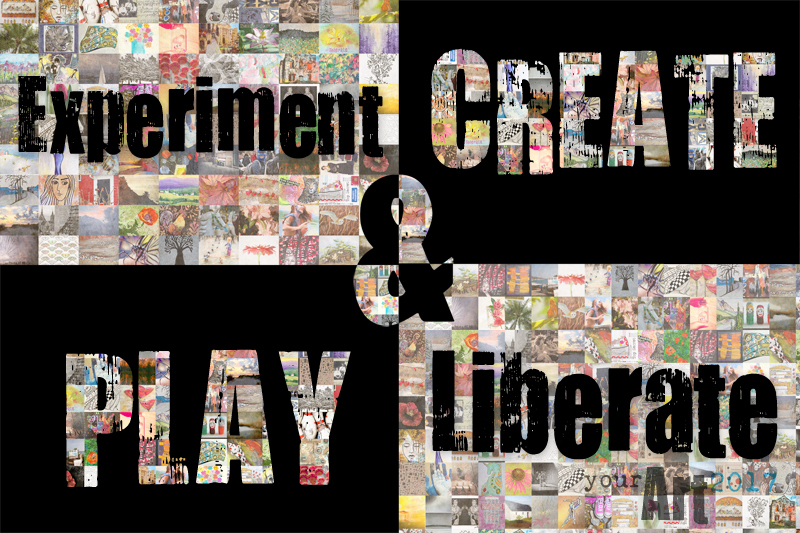 One 6×9″ fine art print of this year’s Final Celebration image “Experiment Create Play & Liberate” shown above. 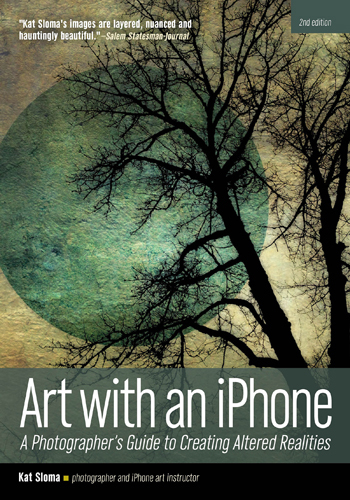 Having this image in your studio will be a reminder of a great way to approach your art. 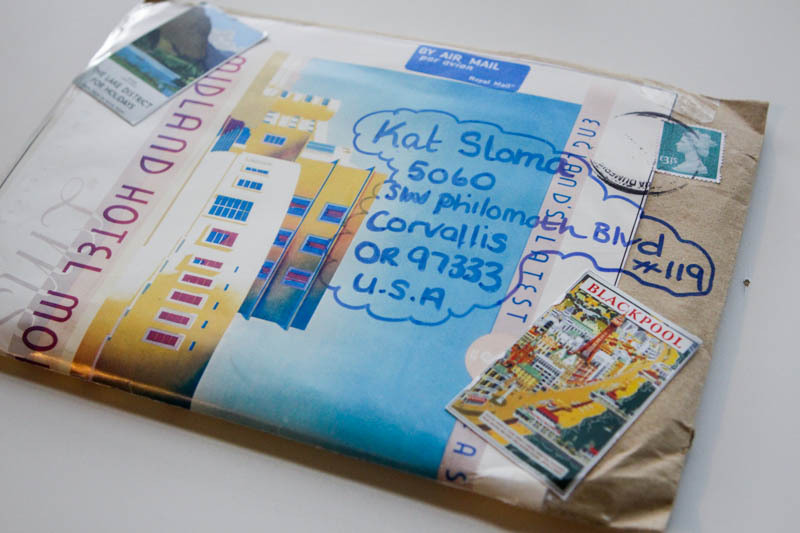 Ten packets of postcards from other participants. 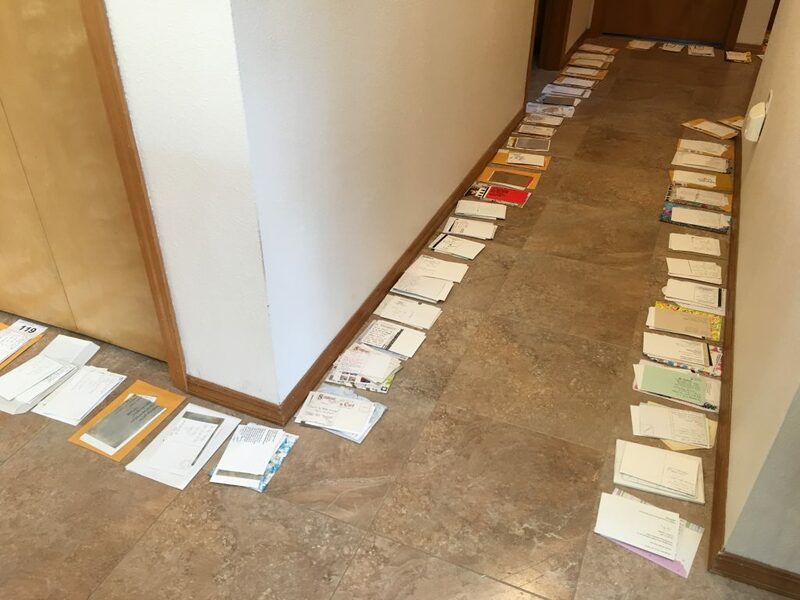 You all were a generous bunch, and even after sharing them with the helpers on swap day, I have lots of extra postcards to share with the rest of you! All right, are you ready? Let’s celebrate! Share your experiences with the 2017 swap. 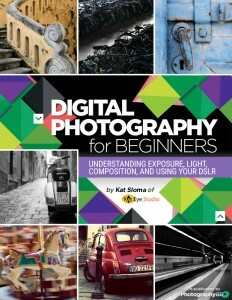 You can link in from a blog, Flickr, Facebook, even Instagram! Make sure your image is public, and you are good to go. The first comes from Andrea in Austria. 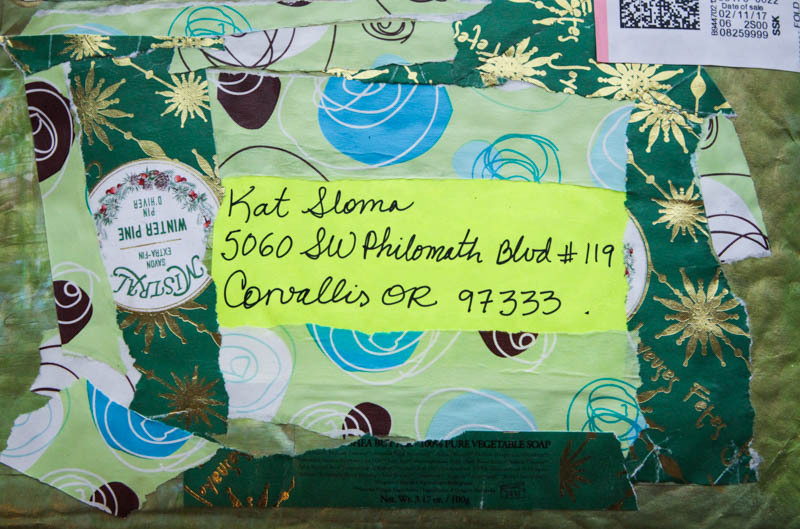 Her envelope was a little worse for the wear by the time it arrived here. Yikes! Close call! I have had envelopes arrive empty before, which is always very sad. Thankfully that didn’t happen here! 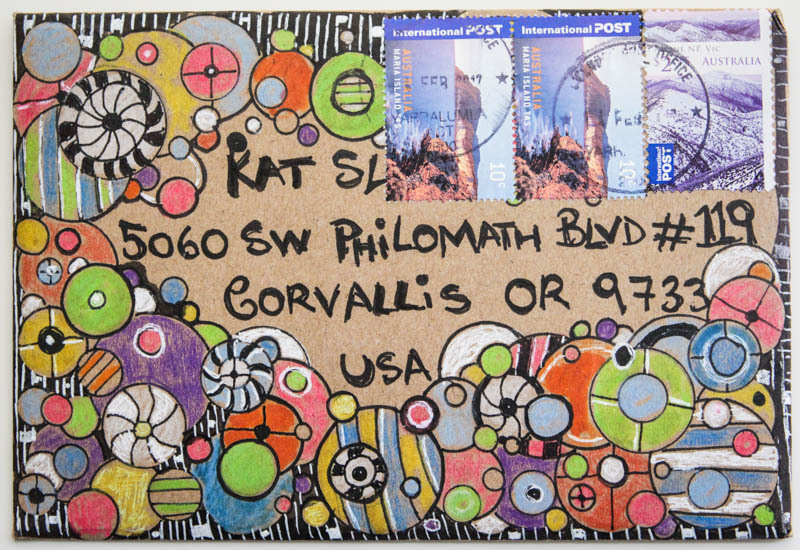 Tennille, another Oregonian, created this lovely envelope-scape! One of my favs this week. Thanks Tennille! This one, from Cathy in Virginia, is painted and stitched. Love this color combo! 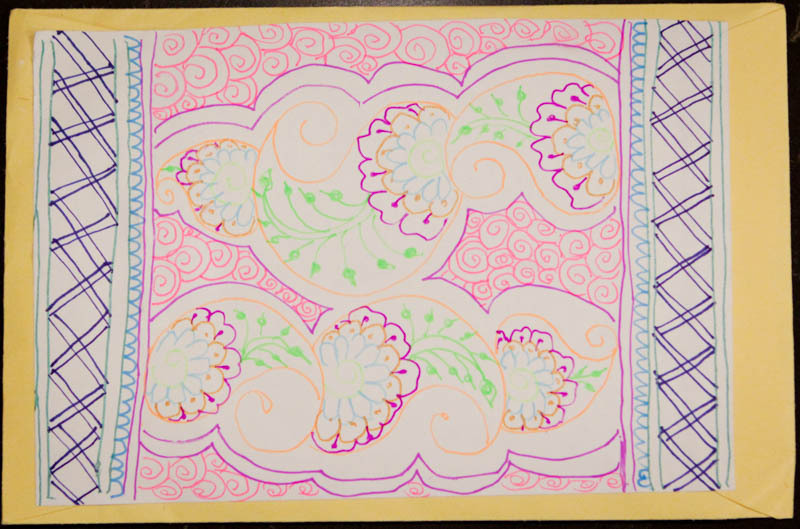 Natasha in California created a lovely design in colored pen. 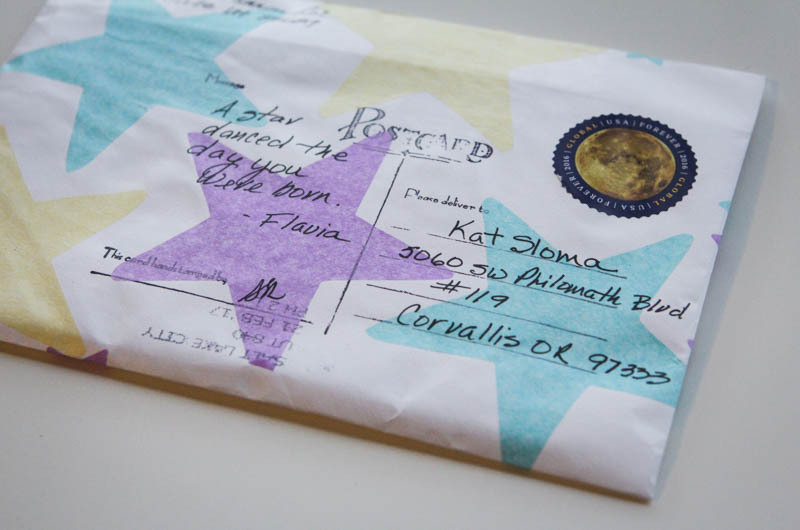 I think Natasha’s envelope has made it on the blog just about every year she’s participated! 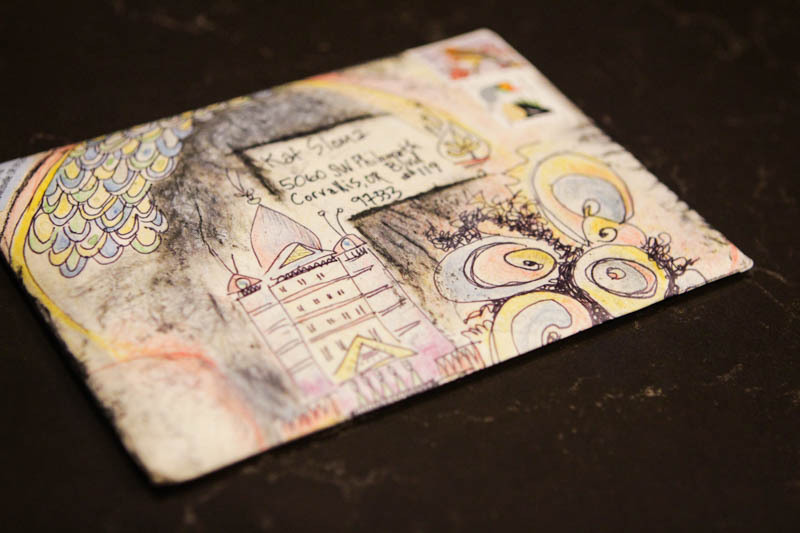 Amy in Nashville created her envelope with the same art as her postcards. Very nice! 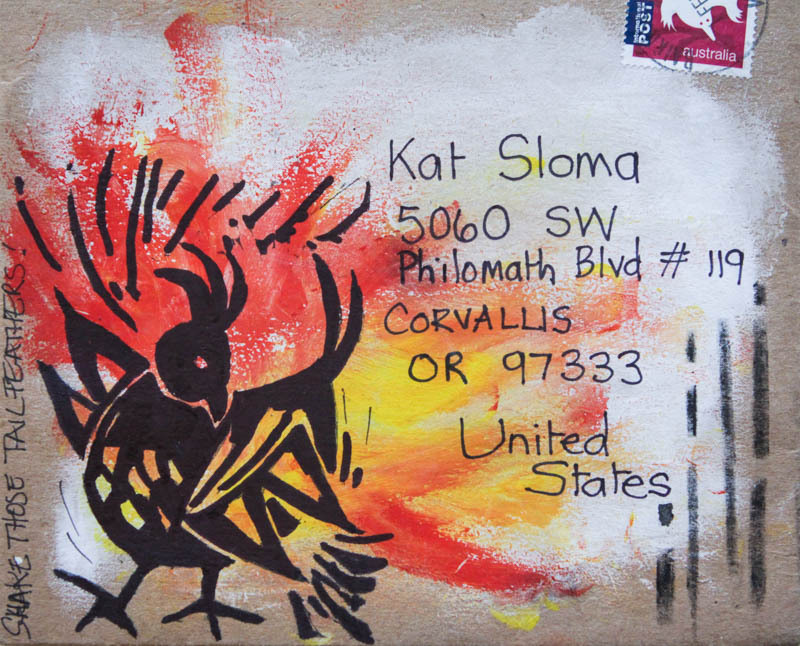 Fast in Virginia created this lovely piece and then printed it onto the envelope. Clever! 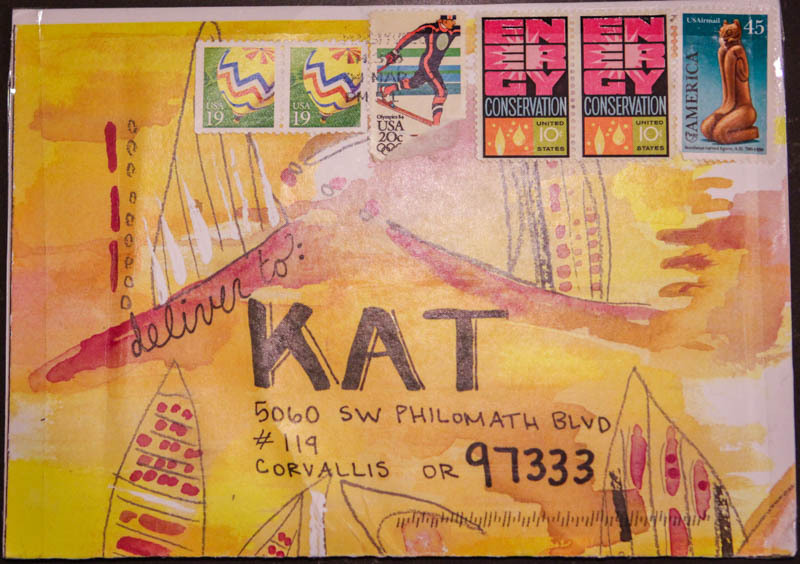 And we finish up this year’s mail art sharing with this envelope from Scott in Illinois. Rock on! 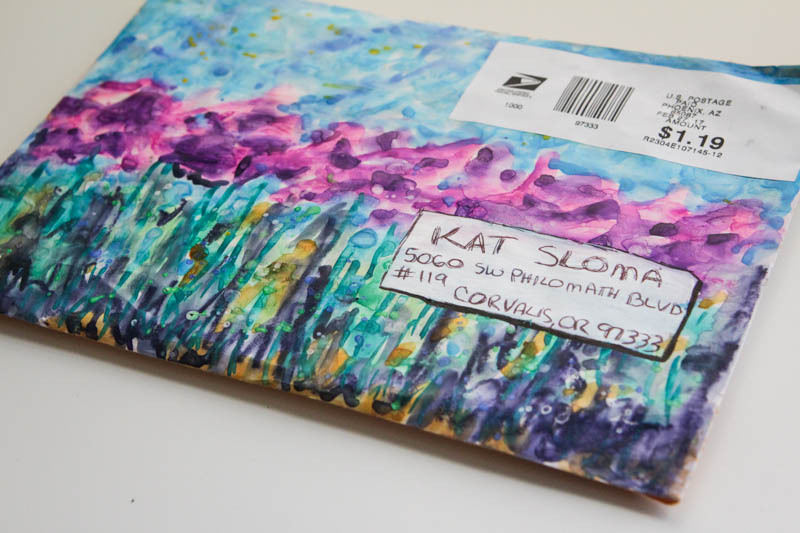 Thank you ALL for sharing your art with every person who handled your envelope. I’ve seen the smiles they bring. 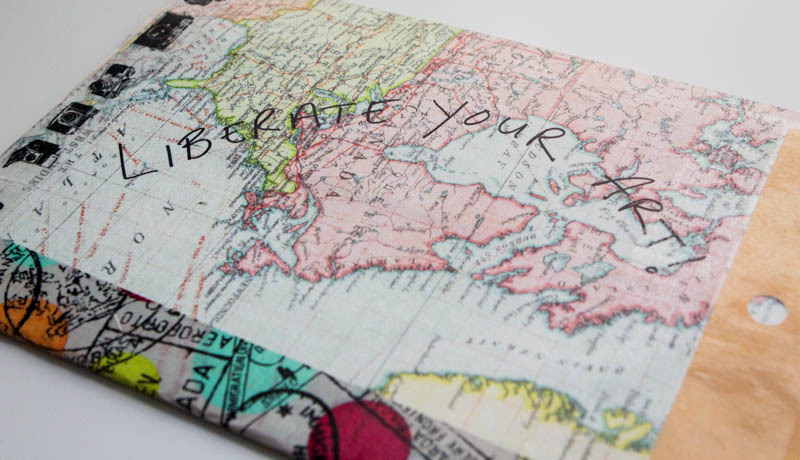 You’ve already liberated your art! The postcards are bonus, at this point. And they will be liberated MONDAY!! 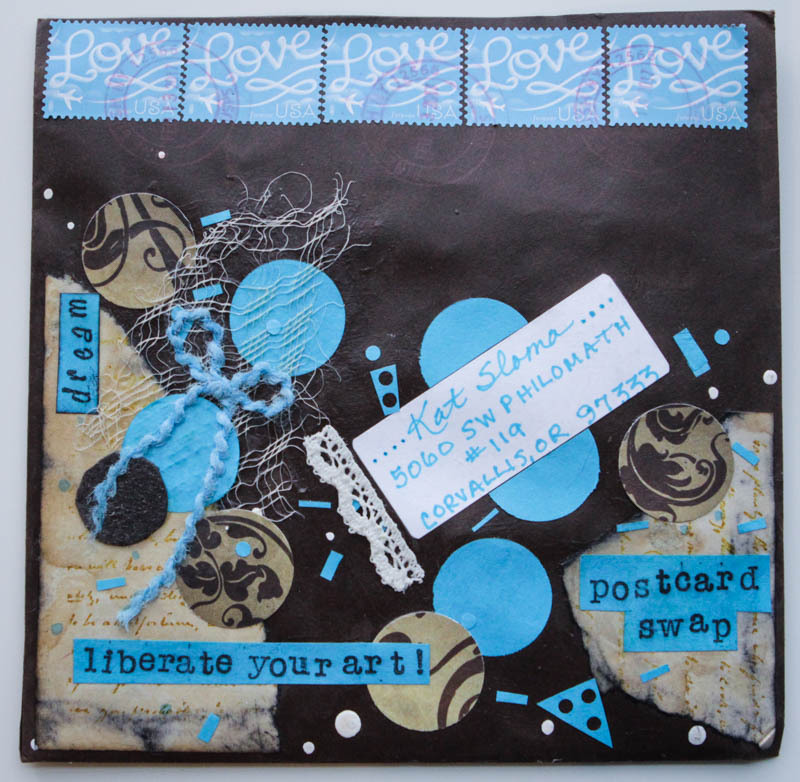 It’s getting down to the wire in the Liberate Your Art Postcard Swap. 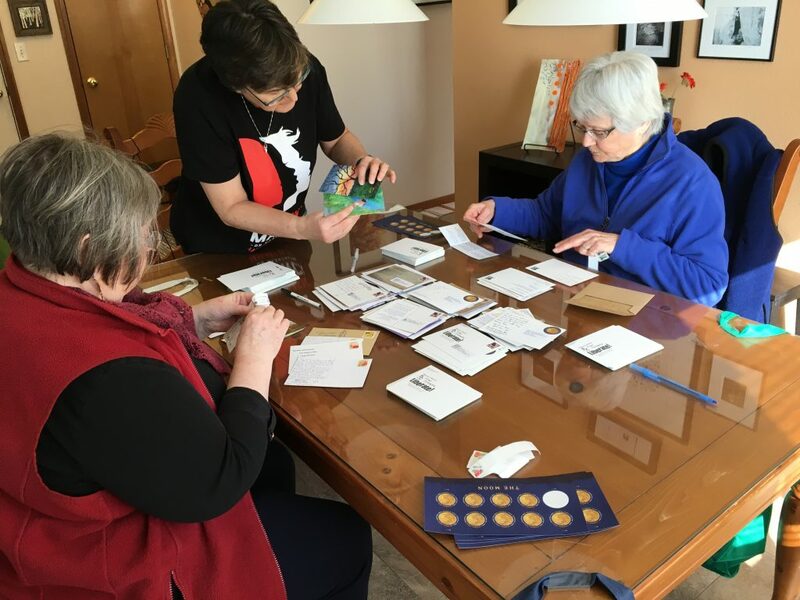 The swap receipt deadline is two weeks from yesterday (Saturday March 18), and swap day is two weeks from today (Sunday March 19). That means art is liberated two weeks from tomorrow! Woohoo! 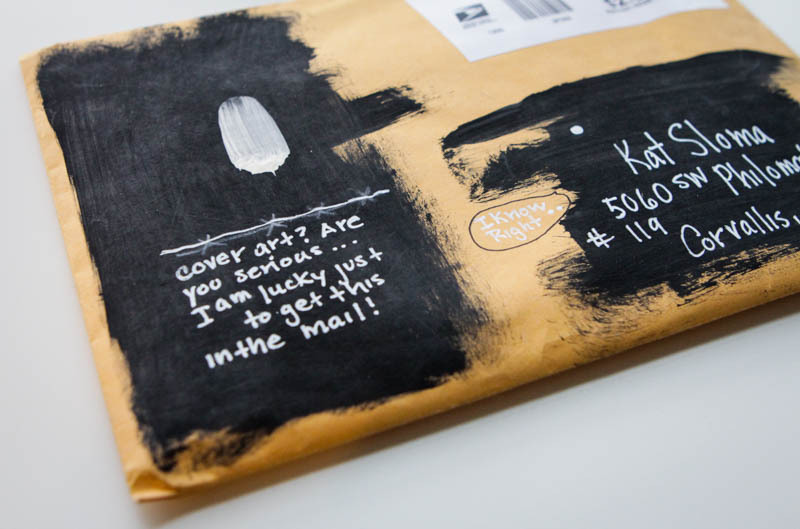 …and added some cool ink art on the back. 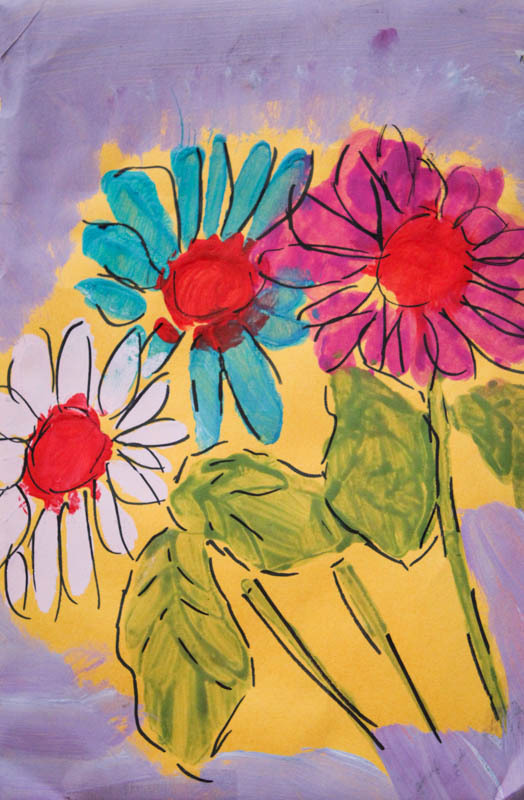 Longtime participant Sheila from Arizona painted what looks to me like a field of blooming wildflowers. I don’t know if that’s what you meant Sheila, but that’s what I see! Deanie in Arizona shows the way to Liberate Your Art! 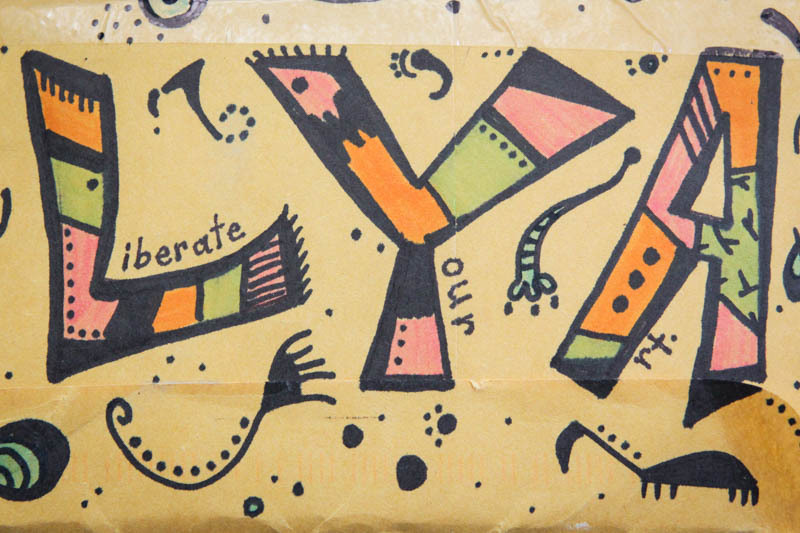 The envelopes for the Liberate Your Art Postcard Swap are arriving fast and furious! It’s an exciting time, just three weeks until swap day. 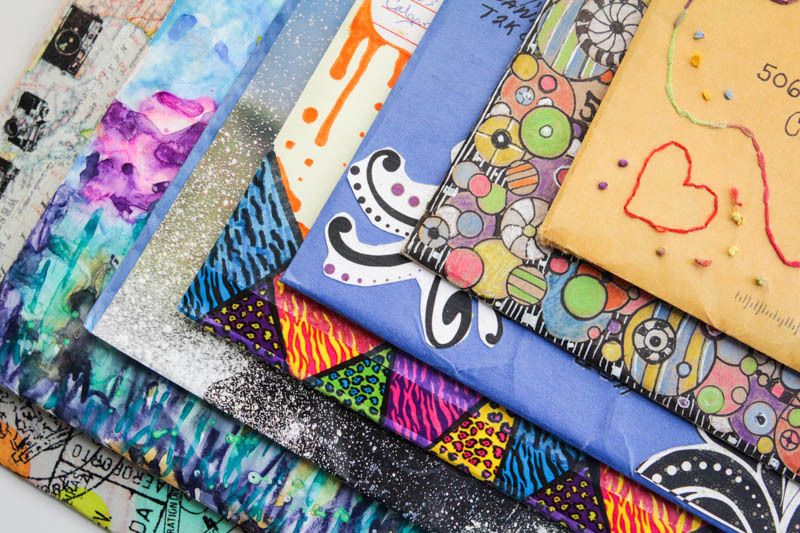 Here are a few of the gorgeous envelopes I’ve received over the last couple of weeks. 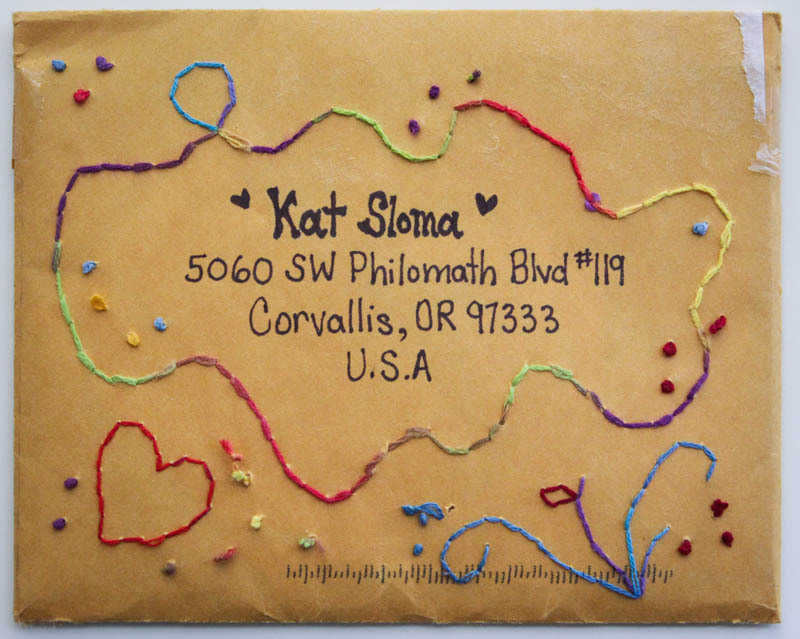 Things are getting busy enough I can’t show all of the decorated envelopes, so forgive me if yours is not featured. 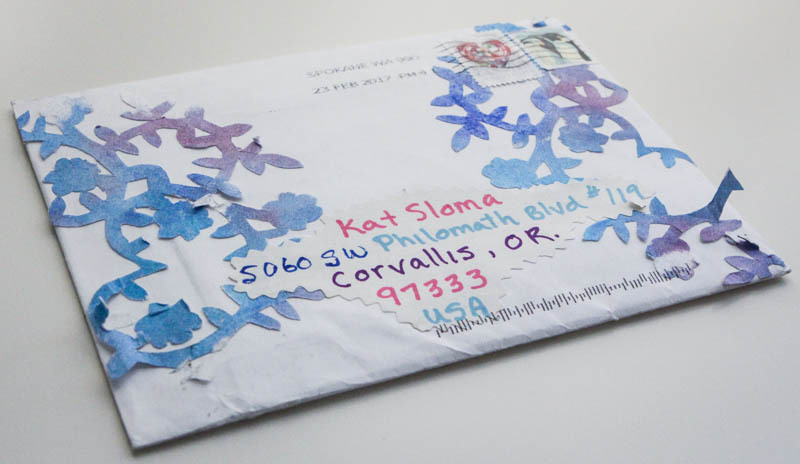 Enjoy these wonderful pieces of mail art! Paula in Virginia created this lovely one. 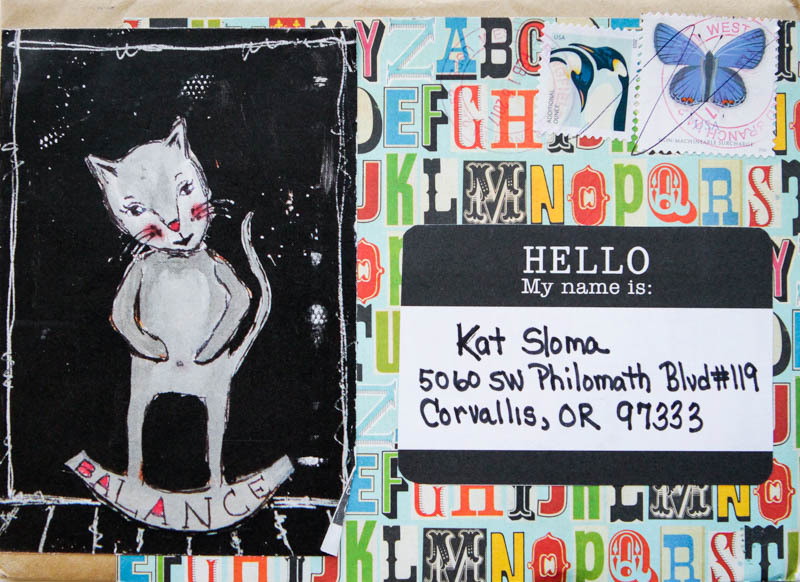 She knows the way to my heart… Put a cat on it! 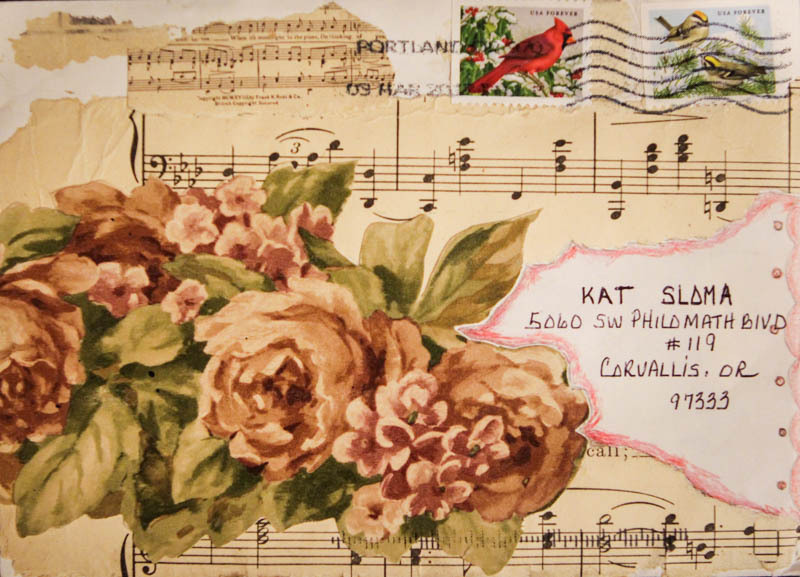 Vicki from New York created one of my favorite envelopes to date. The collage and color is just wonderful. There is a quote on the back: You are never too old to dream a new dream. So true! 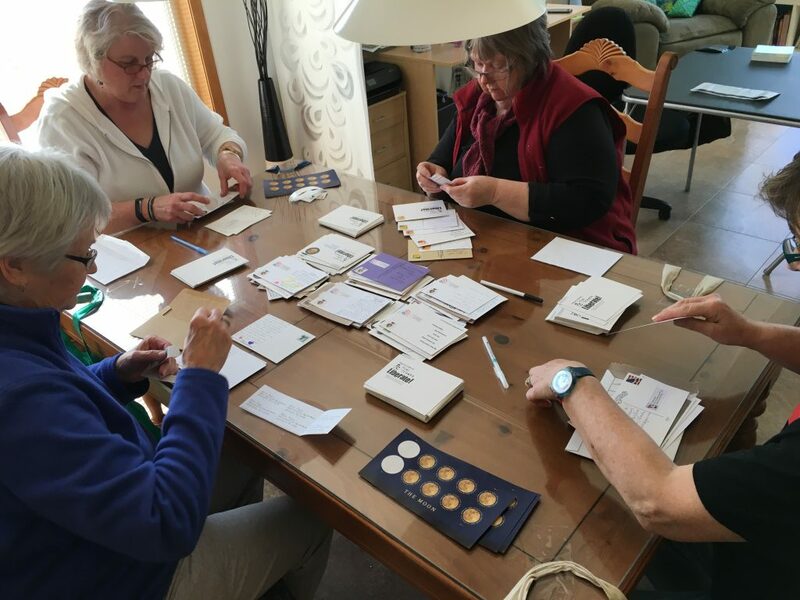 Suzette in Utah found a new way to use a postcard back stamp. Love it! Amanda in the UK makes me want to go on vacation there! 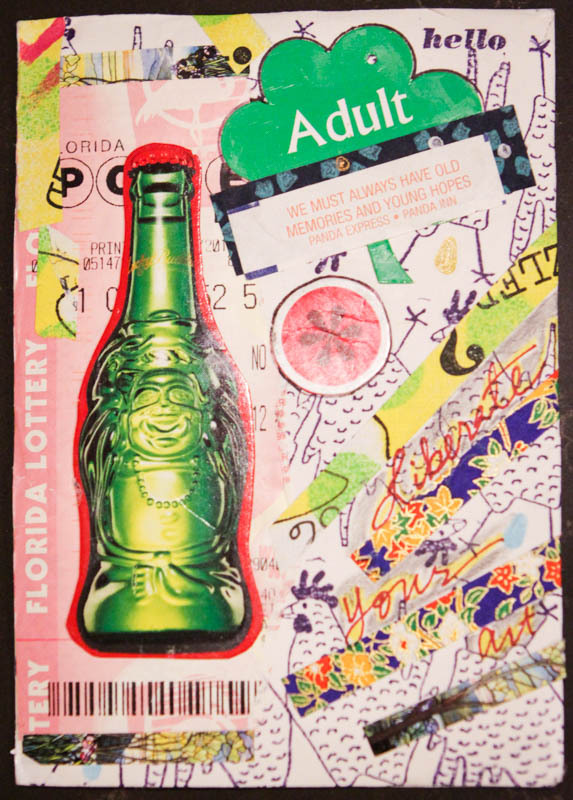 Stephanie in Florida created a bold envelope. Love the colors! Martha in California created a lovely line drawing. In a note on the back, she invites me to finish coloring it in. I will! 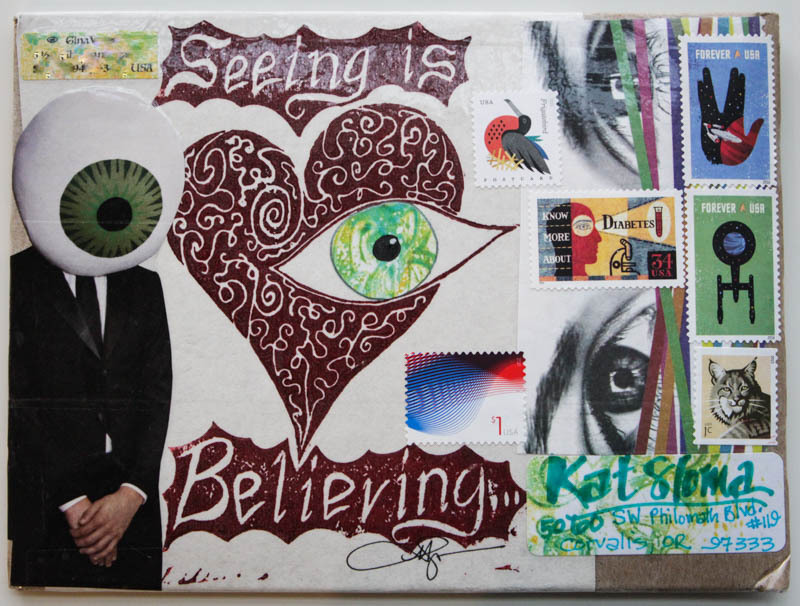 Gina in California says “Seeing is Believing.” I believe your envelope has arrived, Gina! 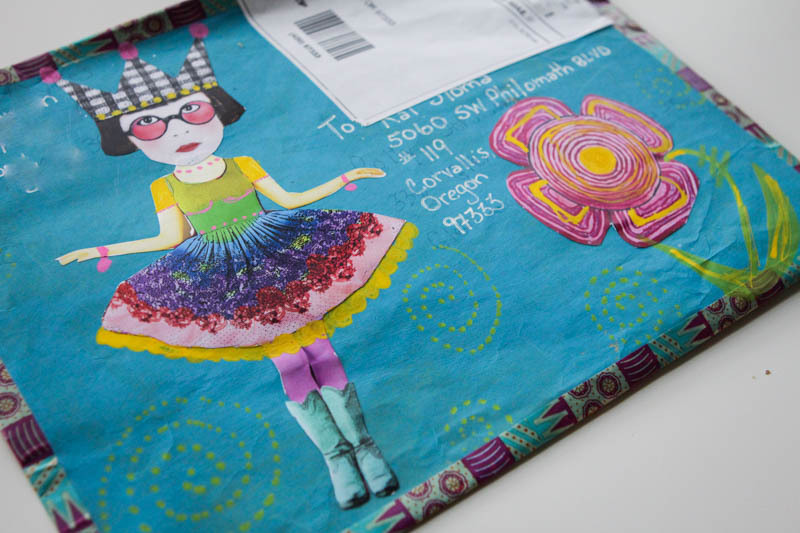 Teena in Virginia proves it doesn’t take a lot of time to create something fun! 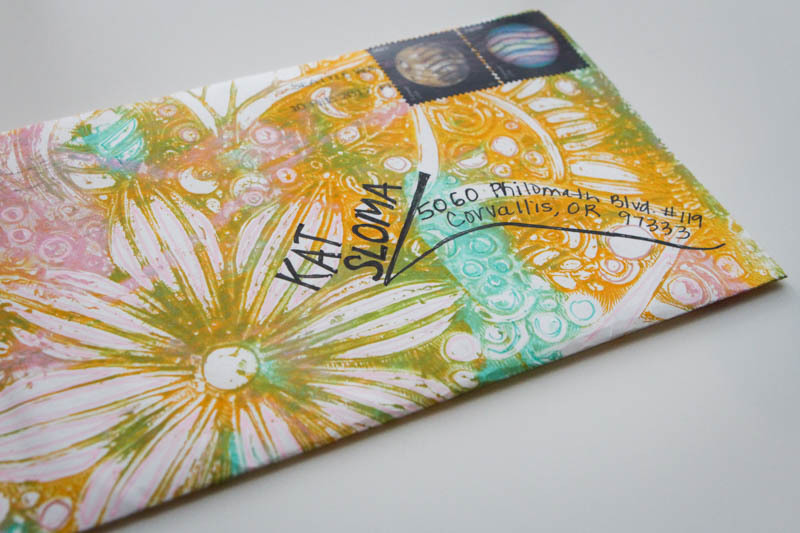 Gloria in California ripped and layered to create a lovely envelope. 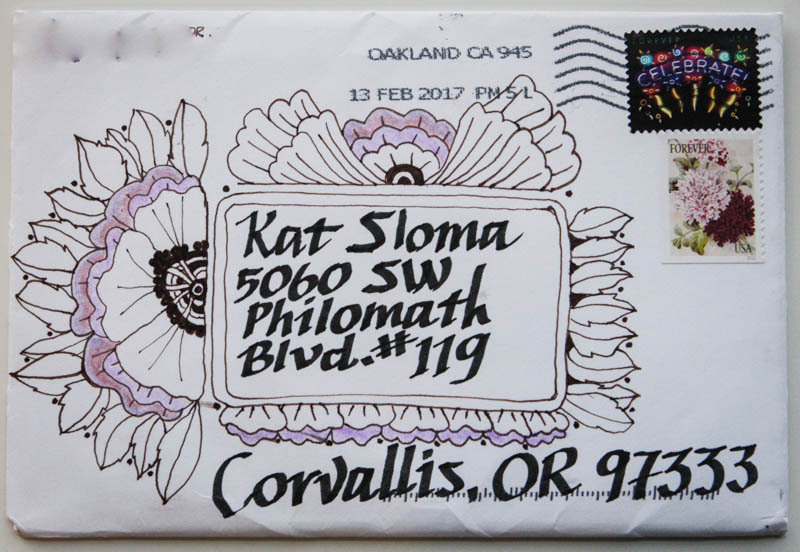 I’m dreaming of spring greens after this envelope! 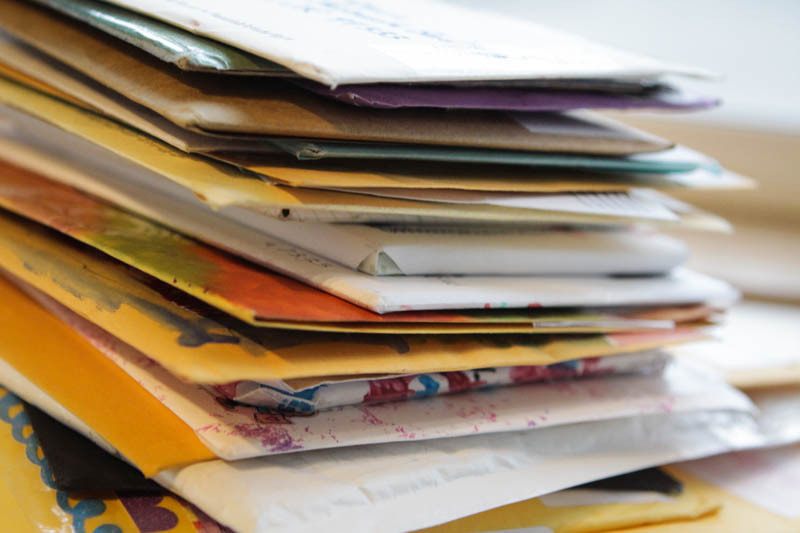 Wrapping up this week’s envelopes is Polly in Florida. 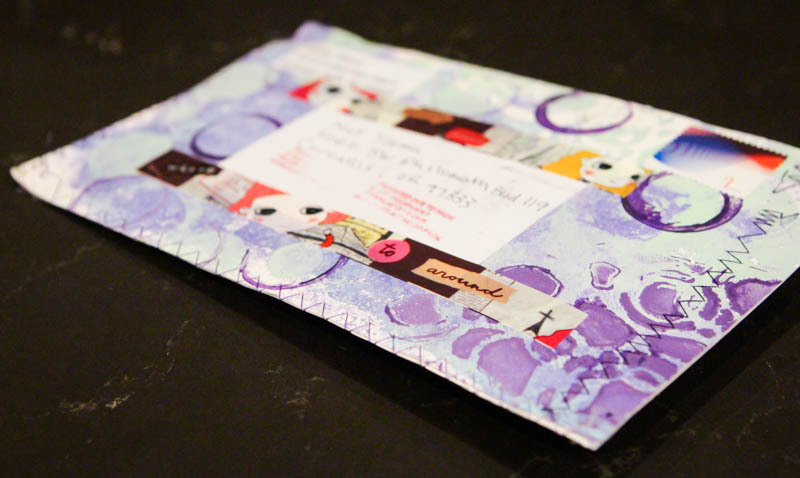 She created this happy envelope, which matches my studio beautifully. 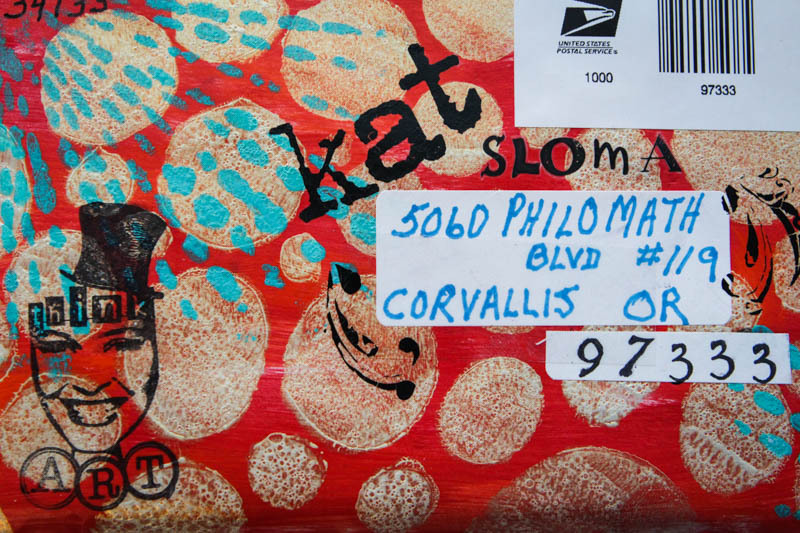 Thank you Polly, thank you everyone for the great mail art that is coming fast and furious! 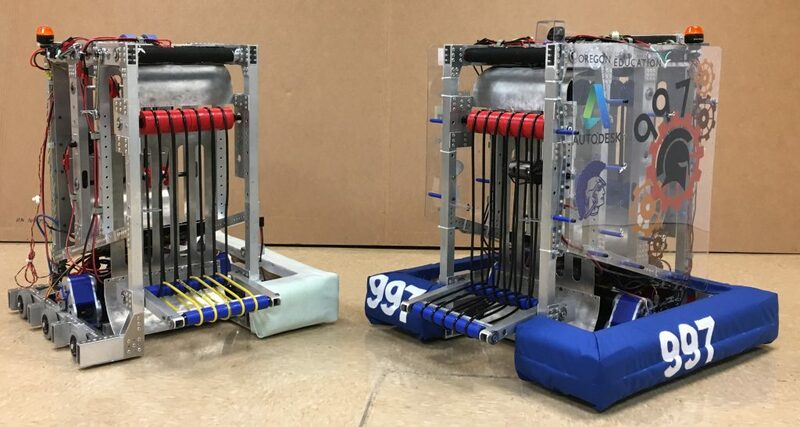 Only three more weeks to swap day. I can’t wait! !